In his autobiography Steve Jobs said "The people in the Indian countryside don't use their intellect like we do, they use their intuition instead, and their intuition is far more developed than in the rest of the world. Intuition is a very powerful thing, more powerful than intellect, in my opinion. That's had a big impact on my work," Jobs later recalled to Walter Issacson, the biographer. We see this in everyday life - the Indian intuition. If you observe how traffic moves on Indian roads it looks chaotic and crazy. It looks like everyone is going to crash into one another and we are going to have one big crazy pile up. But we defy reality - there is a method in the madness, there is an implicit understanding between the drivers and pedestrians of what each one is going to do next. Before you drive on Indian roads you have this feeling that its impossible to drive and that you will probably kill a million people if you drive. Hence there is a deep reluctance to start driving. Once you start driving you develop this intuition and connection with everyone else on the road that the reality of killing a million people never happens. This intuition cannot be taught and passed on to others to give them the confidence that they can drive, it has to be gained by driving. The sad reality is that our education system is killing this power of intuition. I am seeing more and more graduates who pass out are able to very nicely tell me every definition or theorem but they are not able to explain how they will use this knowledge in their work or be able to find holistic solutions that solve a problem using the knowledge they gained in their education. This comes from combining intuition with knowledge and developing a sense of confidence of doing things. 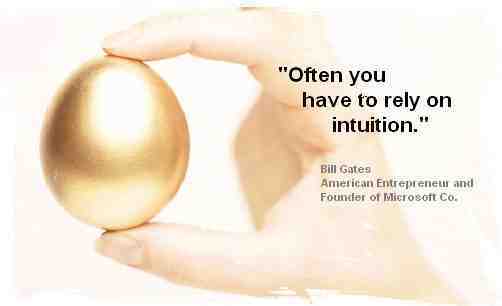 We need to encourage people to use their intuition and not be afraid to experiment. It is only through this will we be able to start solving problems holistically and start providing value which in turn will bring greater success than just outsourcing our intellect. Intellect does not provide all the answers and we have to rely on intuition to take us all the way. There is really no other way to live other than through intuition. The mind can only push through to some extent. But when frustration appears due to seemingly bad choices, it is intuition that shows us the way. Most of us miss the way because intuition speaks too softly. You have to listen with focus. @Shankar - How confident are we to trust our intuition and live life according to it? One must have a lot of confidence in one self to rely on intuition, trust it and follow through with it.